In 2007 two former U.S. secretaries of state, a defense secretary, and a former senator wrote persuasively in the "Wall Street Journal" that the time had come to move seriously toward a nuclear-free world. Almost two years later, the Global Zero movement was born with its chief aim to rid the world of such weapons once and for all by 2030. But is it realistic or even wise to envision a world without nuclear weapons? More and more people seem to think so. Barack Obama has declared "America's commitment to seek the peace and security of a world without nuclear weapons." But that is easier said than done. 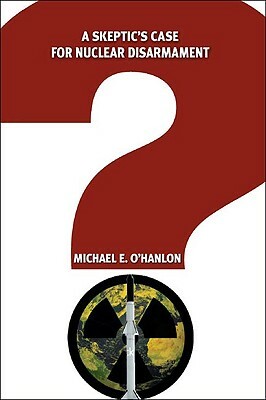 Michael O'Hanlon places his own indelible stamp on this critical issue, putting forth a "friendly skeptic's case for nuclear disarmament." Calls to "ban the bomb" are as old as the bomb itself, but the pace and organization of nonproliferation campaigns have picked up greatly recently. The growing Global Zero movement, for example, wants treaty negotiations to begin in 2019. Would this be prudent or even feasible in a world that remains dangerous, divided, and unpredictable? After all, America's nuclear arsenal has been its military trump card for much of the period since World War II. Pursuing a nuclear weapons ban prematurely or carelessly could alarm allies, leading them to consider building their own weapons --the opposite of the intended effect. O'Hanlon clearly presents the dangers of nuclear weapons and the advantages of disarmament as a goal. But even once an accord is in place, he notes, temporary suspension of restrictions may be necessary in response to urgent threats such as nuclear "cheating" or discovery of an advanced biological weapons program. To take all nuclear options off the table forever strengthens the hand of those that either do not make that pledge or do not honor it. For the near term, traditional approaches to arms control, including dismantling existing bomb inventories, can pave the way to make a true nonproliferation regime possible in the decades ahead. Author Name: O'Hanlon, Michael E.